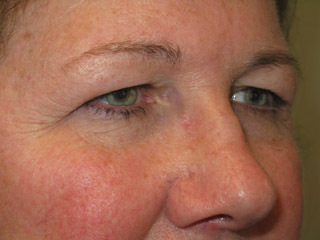 Description: This patient complained that her friends thought she looked �sad� or upset all the time. She had large bags of skin hanging down from her upper eyelids in front of her eyes which restricted her ability to see, as well as low eyebrow position. 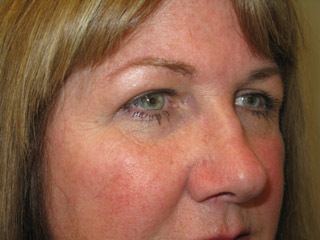 These factors caused her to constantly wrinkle her brow and forehead in an effort to lift the skin up to see. 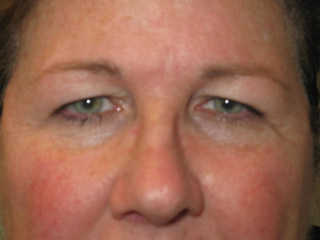 After discussion of both brow lift and blepharoplasty, the patient elected for both brow lift and upper blepharoplasty. The patient was back to work after one week with mild swelling and bruising, and went to a reunion of old friends 3 weeks after her procedure. 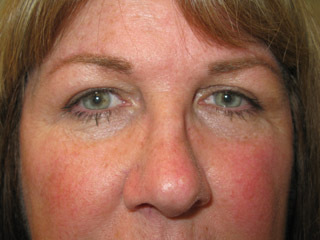 The brow lift in addition to the upper eyelid blepharoplasty results in a pleasingly elevated arched brow which opens and brightens the eyes, and tightens skin further onto the temple than a blepharoplasty alone.